The Potters Barn is set in the heart of the UK in the beautiful Cheshire countryside next to the Trent and Mersey canal and close to Junction 17 on the M6 motorway. The Potters Barn is a fully working pottery and open to the public most days. Here you can see how and where the pottery is made, see the finished items on display in our gift shop. 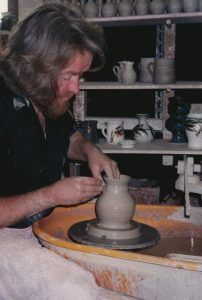 Why not have a go – “Play with Clay”, Paint Pottery or take a turn on the Potters Wheel. If you are bitten by the creative bug we have regular pottery classes. We also run many other craft courses such as silversmithing, upholstery, stone carving or long bow making to name but a few…… the choice is yours. Childrens parties, Corporate events, Teambulding, Hen parties, we recently did a 50th birthday party…….the Potters Barn is something different, no matter what the occasion, young or old , ‘playing with clay’ appeals to all !